National Parks in Australia are recognising the importance of leading by example, with the newly certified Advanced Ecotourism and ROC certified, Murray Valley National Park adding to the existing National Parks certified through Ecotourism Australia. National Parks must remain competitive with other tourism products and services, and certification provides the quality assurance needed to be equally considered for awards submissions and grant funding. By going through the process of certification National Parks can benchmark their performance against industry best practice standards whilst also demonstrating to ecotourism operators their support for best practice operations in their parks. For more information about Ecotourism Australia, you can visit our website here. Congratulations to Noosa Ferry Cruise Company for achieving Nature Tourism and Ecotourism Certification. Their Noosa cruises operate daily and include the Noosa Ferry Classic Cruise, Sunset Cruise, Cruise Noosa Biosphere with private charters also available. The Noosa Ferry cruises operate along the historic riverside town of Tewantin while winding along the waterways past Noosaville into the heart of Noosa. Close to parks, restaurants, entertainment and accommodation the 7 stops on the ferry journey allow customers to get the most out of their stay. Noosa Ferry Cruise Company also offer a great price on all the cruises especially with their ‘all day pass’ which allows you to enjoy at your leisure all that Noosa has to offer. Recently included Noosa Biosphere Cruise takes customers through the Noosa reserve. Complimentary morning tea is included while they take you to a secluded spot for a short walk where you can learn about the bird, animals and plant life of the Sunshine Coast. For more information on Noosa Ferry Cruise, click here. For more information about Ecotourism Australia’s ECO certification program, click here. Congratulations to Programmed Facility Management for achieving Climate Action Business certification! Programmed Facility Management is one of Australia’s leading providers of facilities management services. They provide the people, maintenance, tools and expertise to help businesses grow by offering a comprehensive range of facilities and asset management services, tailored to the unique needs of each client – from full management of all facilities through to provision of a single support service – allowing clients to focus on their core business. To find out more about Programmed Facility Management, click here. To find out more about Climate Action certification, click here. At the Annual CAUTHE Conference 2014 held in Brisbane last week, during his keynote speech, Dr Taleb Rifai, Secretary General of United Nations World Tourism Organization urged the major players in tourism globally to prioritise sustainability. With the latest UNWTO statistics reporting 1.8 billion travellers crossed international waters globally in 2013, Dr Rifai outlined the huge impact that would be made if each of those travellers made simple, sustainable travel choices throughout their journey. 1.8 billion travellers equates to approximately 1 out of 7 of the world’s population. Think of the impact of 1 out of 7 people consciously making travel choices based on local, environmentally responsible and ethical tourism practices? Dr Rifai highlighted the growing trend of consumers demanding more destinations and products that match their expectations as responsible and ethical. This is great news for our certified operators. Ecotourism Australia’s certified operators practice ecotourism principles, demonstrating economic, environmental and social sustainability. To learn more about Ecotourism Australia’s certification programs, please click here. Murray Valley National Park – Advanced Ecotourism and ROC certified! Congratulations to Murray Valley National Park for becoming Advanced Ecotourism and ROC certified. Home of the river red gums and the mighty Murray River, the opportunities for adventure are endless in the Murray Valley National Park and Murray Valley Regional Park found in southern New South Wales. For keen fishermen, avid birdwatchers and devoted bushwalkers, there’s an array of hidden gems nestled within these river red gum precincts. 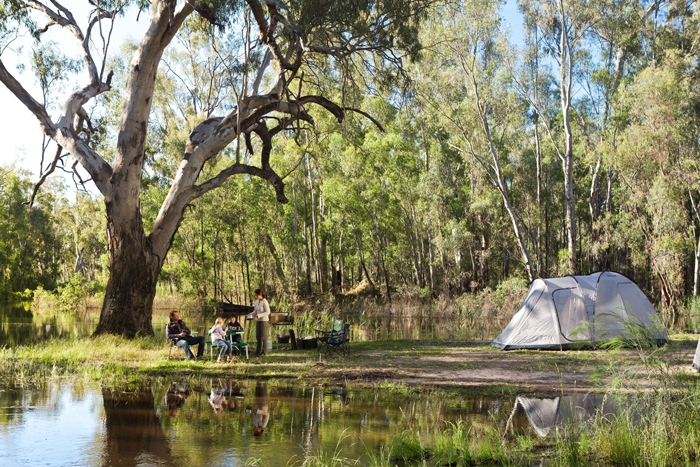 The parks has a side range of camping options, provides a haven for birds and bird-watchers alike at the the Reed Beds Bird Hide and the Moama Five Mile precinct is home to world class mountain bike tracks. Murray Valley National Park are fully committed to conserving the natural areas, biodiversity and threatened species of Murray Valley. They are working alongside their local communities to protect the cultural and historic heritage of the Park whilst encouraging visitors and communities to enjoy and value the environments on offer. For more information about the Murray Valley National Park, visit their website. For more information about our ECO certification program, visit our website. The Carbon War Room and Rocky Mountain Institute are teaming up on a project called Creating Climate Wealth—The Ten Island Renewable Challenge. The aim is to set an example for moving toward a renewable energy future which could be rolled out around the world. The islands involved (Antigua & Barbuda, Aruba, the British Virgin Islands, the Cayman Islands, Dominica, Grenada, Puerto Rico, San Andres (Colombia), St. Kitts & Nevis, St. Lucia, St. Vincent & the Grenadines, Turks & Caicos, and the U.S. Virgin Islands) feature pristine beaches and postcard perfect sunsets. They also face incredibly high energy bills as they receive millions of tourists each year and depend on expensive, imported fossil fuel for energy generation. Whilst technologies and other solutions to use clean energy are available they haven’t been widely implemented. The Carbon War Room and Rocky Mountain Institute are working to bridge that gap, identifying barriers and detailing solutions that can attract private sector investment and enable aggregated demand for large-scale renewable energy systems. They are set to start by focusing on projects in five categories: schools, hospitals, tourism resorts, transportation, and utility-scale renewables. For the full story on the project including an information video, please click here. Lone Pine Koala Sanctuary, located in Brisbane, has just achieved Nature Tourism certification. In a natural setting along the river, Lone Pine Koala Sanctuary currently have 130 koalas as permanent residents along with kangaroos, dingoes, wombats and other native Australian animals. Lone Pine Koala Sanctuary is also one of the few places where visitors are able to hold a koala and have their photo taken or feed the kangaroos that roam free. Shows run throughout the day showcasing the different animals in an educational format with activities for the younger children to also get involved. For the bolder visitors you can have your photo taken while you hold a snake or baby crocodile. Founded in 1927, Lone Pine Koala Sanctuary have continuously shown their dedication towards conservation and education to the public about Australian species that are under threat. For more information on Lone Pine Koala Sanctuary, visit their website. For more information about Nature Tourism certification, visit our website.